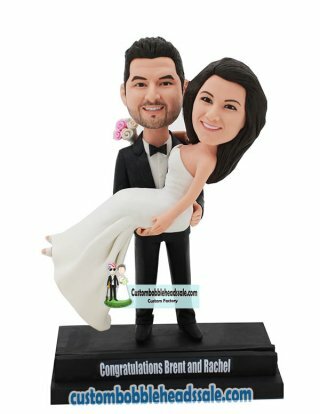 this custom bride and groom bobbleheads are second to none. Imagine how the guests and new couple will react on this bobbling figurines. Especial when you tip the heads and make it bobble adorably. It will become a hit in the wedding ceremony. Standing 7 inches and posing to dance, this custom bride and groom bobbleheads are perfect to resemble the lovely faces of the newlyweds. Being cherished by the new couple, this mini new couple will bobble happily for a life time.